Non-food credit outstanding also fell slightly. The year-on-year (y-o-y) growth rate in bank credit fell to 14.9%, well below the 16.3% y-o-y growth seen on 3 July. Non-food credit growth y-o-y was 14.96%. Nevertheless, the y-o-y numbers may not tell you much because of the very high crude oil prices in the year-ago period, which led to huge borrowings by oil companies. A month-on-month comparison could be more revealing. As the chart shows, growth in non-food credit during the four weeks to 14 August was Rs23,687 crore, well above the Rs19,859 crore growth notched up during the previous four weeks. 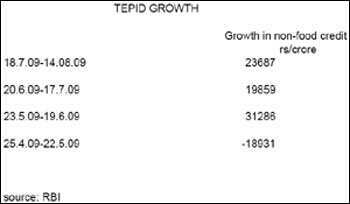 Unfortunately, though the growth is still well below the surge in growth in May-June, when non-food credit growth was as high as Rs31,286 crore in the four weeks to 19 June. That has not happened. It’s also possible that the sharp rebound in credit during May-June was a temporary phenomenon—as the stock markets have improved, many companies have started raising money through qualified institutional placements and private placements, which would have lowered the demand for bank credit. As the RBI’s Macroeconomic and Monetary Developments Review pointed out, financing of companies from non-bank sources, including the Life Insurance Corp. of India, during April-June was much higher than the growth in bank credit during the period. This trend must have been reinforced by the rush to raise funds by companies since then. Moreover, as the review had pointed out, growth in corporate lending was quite robust and banks had cut down on retail loans. But now that we are approaching the so-called busy season, while lending rates on housing loans have been reduced, loan growth should start picking up.